...... Initially, it was written for Borland C++ Builder and while I used Borland's VCL for the front-end, I wrote the back-end code in clean C++. This meant I was later able to swap-out the front-end code and replace it with a wxWidget implementation. I initially released the game under the under the name of "Celesteroids". With this version, as well as changing the name, I swapped-out wxWidgets and replaced it with Nokia's QT framework. I have also improved the playability a little I hope. 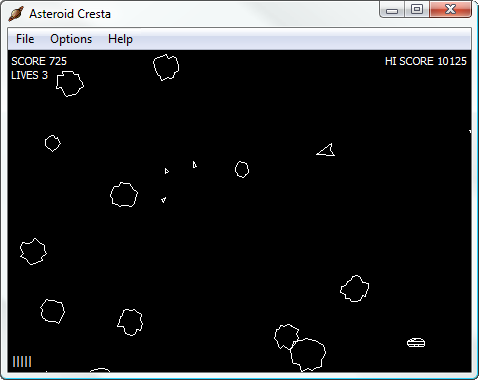 "Your mission is to destroy all the asteroids "
A new interface with superb graphics and sound effects game. Show the world of stars, planets, asteroids and nebulas. Qweas is providing links to Asteroid Cresta 1.7 as a courtesy, and makes no representations regarding Asteroid Cresta or any other applications or any information related thereto. Any questions, complaints or claims regarding this application Asteroid Cresta 1.7 must be directed to the appropriate software vendor. You may click the publisher link of Asteroid Cresta on the top of this page to get more details about the vendor.